This past year has been very productive for the K-State First Student Advisory Council. We have continued to be successful in recruiting students through speaking with them at booths and following up with them through email and letter writing. We started a new event event called Cookies and Cocoa, which was very successful. We even had a little fun during the year, including our winter holiday party and our new member meeting at Varsity Donuts. Cookies and Cocoa was a new event we held last fall on Bosco Plaza. SAC members served cookies and hot chocolate to students passing by and then surveyed them to find out what they knew about K-State First. 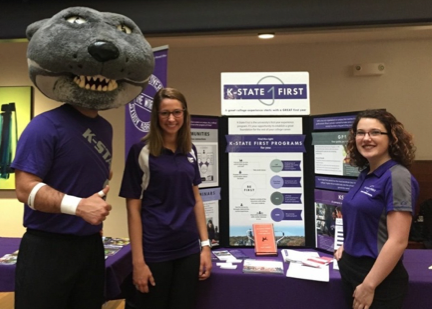 Most students said they had heard of K-State First, but did not know what the program offered to students at Kansas State. This was good information to know and we had fun along the way. We plan on offering another Cookies and Cocoa event this December to bring students into the new K-State First office in Holton. We also selected a new officer team and invited new members to join SAC! To celebrate all of our new members we met at Varsity Donuts to get to know each other and talk about our plans for the upcoming year. We are really excited for the great ideas and plans they have for the organization. One of our top events this fall has been the KSBN Get Curious Event that was connected to the common read for this year, “The Curious Incident of the Dog in the Night-Time” by Mark Haddon. Members of SAC attended the event and had a great time learning more about this year’s book. SAC members hosted two of our generous donors, Bill and Debbie Miller, while attending the event, as well as enjoying the event themselves. The event consisted of multiple 10-minute presentations covering the book, as well as its themes. Lectures that were included covered a summary of the book, as well as; “Note to Self: A Perspective on Family, Success, and Enjoying Your Life Journey,” “10 Ways That Animals Help Bring Out Our Humanness,” “Red, White and Bruise: When Policing Mars the Innocent,” “Under the Sea, Magical Worlds, and the Universe: Queering Pop Culture Representations of Exceptional Talents” and scenes preformed by theatre students. Overall, the event has been a highlight for SAC members this fall. Overall, we have had a great year and we are very excited for what is coming up next for the K-State First Student Advisory Council.